You wanna know my favorite thing about fashion? I love that I can wake up and show how I’m feeling that day through an outfit. Regardless of what society tells us, we can be whoever we want to be and I think fashion is the greatest way to do so. Whether I’m feeling preppy, boho, hipster or any other label people want to put on it.. with an outfit I can show how I’m feeling for the day without having to actually define myself as one or the other. I don’t know about you, but I wake up feeling differently each and everyday. Fashion allows me to show who I want to be and that is my favorite thing about it.. And that’s what I have to say about that. 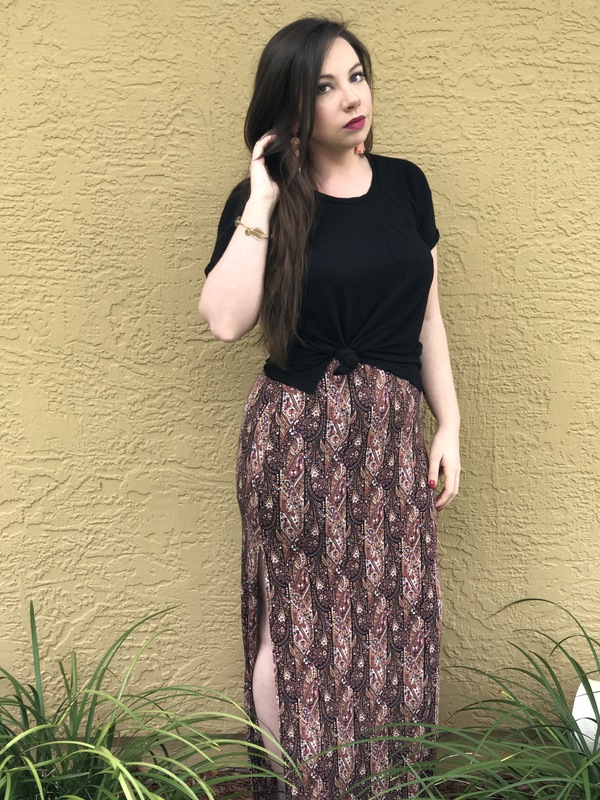 I paired this boho maxi (hi-waisted) skirt with a basic pocket-tee. 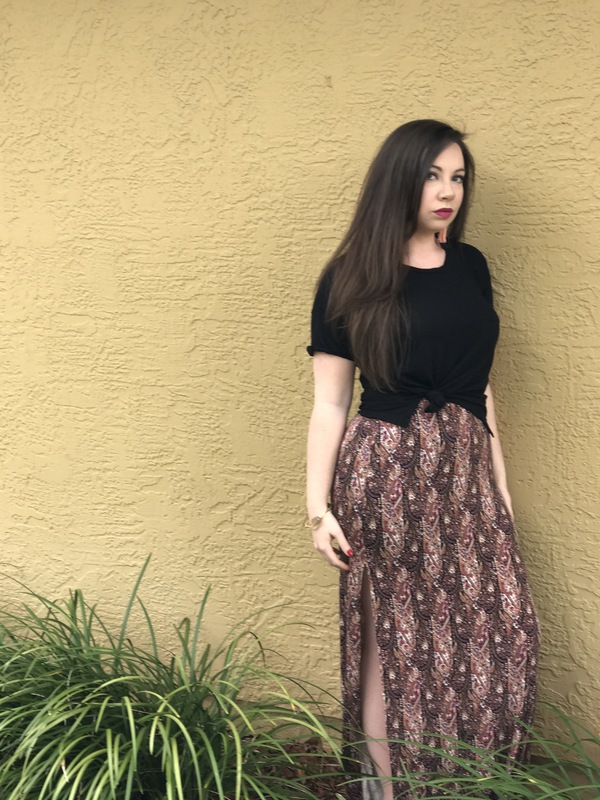 The only difference is that I wanted to show the hi-waist on this adorable skirt. So, again I made my personality show by tying a knot in the shirt to make it cropped. It gave me a defined waist, and that’s my style. Personally, I have to have something with structure and a defined silhouette for it to look good on me. (And to feel comfortable with myself) I know we all have those little things that we do and don’t like about how an outfit looks on us. Hence, the reason I shortened the top. Just how I like it! Y’all ever heard of Lisi Lerch? 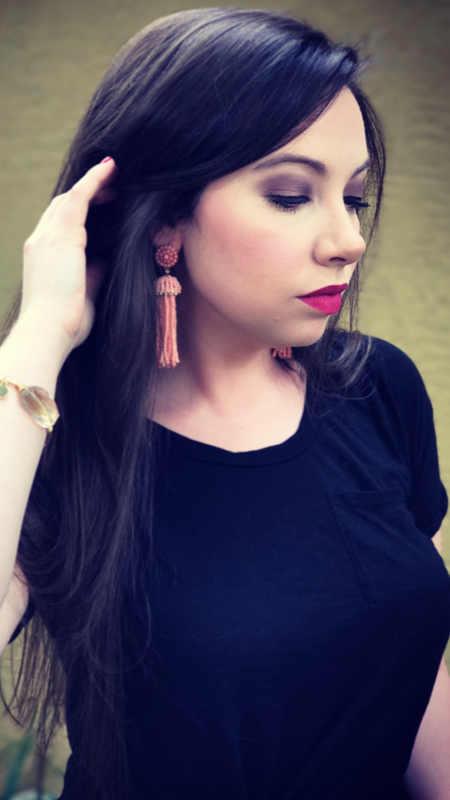 They have the most adorable beaded tassel earrings. However, they are a bit on the expensive side. I purchased the pair I’m wearing at Francesca’s, and I think they look just as adorable as the Lisi Lerch brand. If I were going to splurge I would definitely get the aqua pair made my Lisi, but for now these are a more versatile color for my wardrobe. (Also, these were a lot less expensive) The accessories with this outfit are pretty simple. This is mainly because I felt with the busy pattern of the skirt it didn’t need to be accessorized to the extreme. The skirt speaks for itself. Lip color: Anastasia Beverly Hills in the color Catnip. I also wouldn’t have paired red nails and toes with this outfit because I’m wearing pinks and that sort of drives me crazy.. but I wasn’t up to changing the color. So, there’s that. 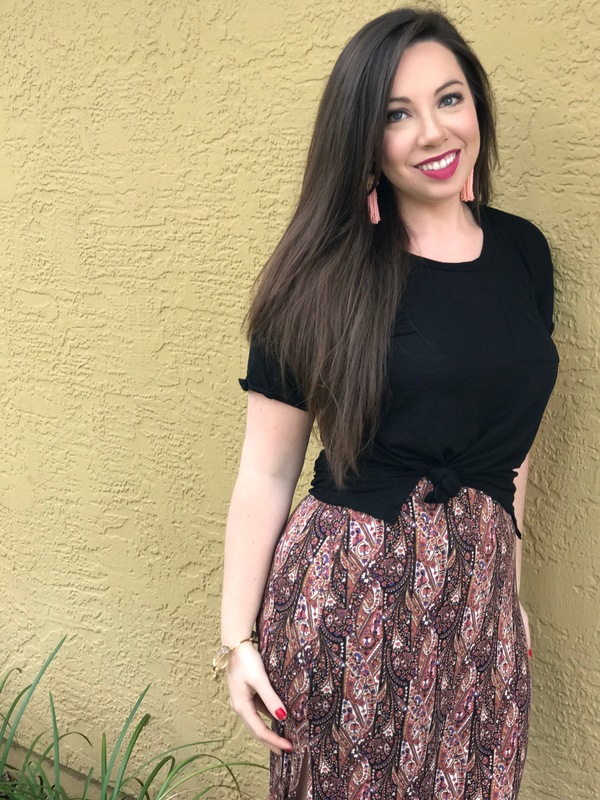 Sandals aren’t pictured, but they are a versatile, gold, inexpensive pair that everyone needs for their spring/summer wardrobe. The price will be your favorite part!